DETROIT — The people have spoken, casting more than 100,000 votes in the fourth annual America’s Transportation Awards competition. Holding tight onto an early lead, the Washington State Department of Transportation claimed the People’s Choice Award for its Operation I-5 Partnership Project. A panel of transportation experts also weighed in on its favorite project in America, selecting the Florida Department of Transportation as the Grand Prize winner for its Interstate 10/Interstate 95 interchange rebuild known as “The Big I” project. Both awards were announced during the American Association of State Highway and Transportation Officials Annual Meeting. 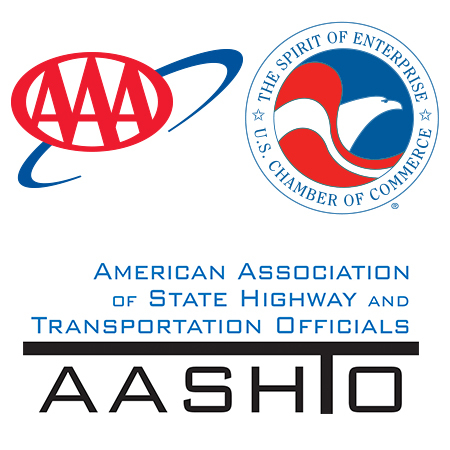 AASHTO, AAA, and the U.S. Chamber of Commerce sponsor the America’s Transportation Awards competition, which recognizes outstanding transportation projects in three categories: On Time, Under Budget, and Innovative Management. The 10 projects that scored the highest during four regional contests competed for both the Grand Prize and the People’s Choice Award. WSDOT worked with a coalition consisting of federal, state, military, and local leaders to creatively solve the traffic problem that stretched for miles along I-5 through the Lewis-McChord military base nestled between Tacoma and Olympia, an area seeing robust growth in economy and population. Interchanges at military gates were improved with better alignment and better-timed traffic signals, gates that had never opened were unlocked so military personnel could access the base more easily, and tools such as Incident Response were quickly deployed to combat congestion, saving commuters plenty of time on the road. FDOT’s reconstruction of the I-10/I-95 interchange consisted of 17 bridges, 21 ramps, and 25 lane miles built over and around traffic moving through one of the busiest interchanges in the state. The interchange — where two of the country’s longest and most heavily traveled interstates intersect — was originally built in the 1950s and desperately needed an upgrade. The project finished six months ahead of schedule, saving taxpayer dollars and countless commuting headaches. A total of 40 projects from 29 states were entered in this year’s America’s Transportation Awards competition.